The original upholstery on this chair was inexpensive reconstituted leather which was badly deteriorated. Reconstituted leather is made from pulped leather that is glued and pressed into sheets and covered with an artificial surface. This material was designed for use in shoe insoles. It tears easily especially at stress points like seams. 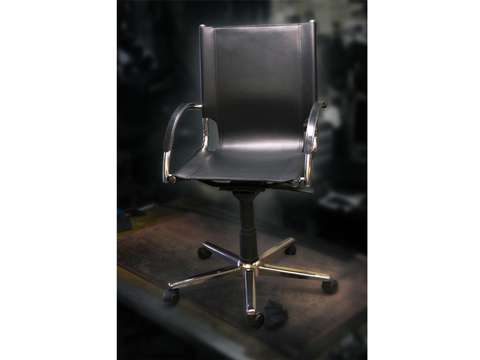 The seat, back and arms were replaced with a leather grained plastic covered chrome split leather (Porvair) to reproduce the original appearance in a more durable real leather finish.